Winds around 2 pm went above 40 mph as the National Hurricane Center predicted. I went for a walk and I just looked around and photographed what I saw. This walk would no longer be possible this Saturday afternoon, just to be clear. Tonight they say it will land in the early hours as a category four with plenty of flooding. Key West Police are not evacuating but police cars will no longer responding soon. We will continue to take phone calls 24 hours even though we cannot send help at the height of the storm. Our jobs kick in after the storm to help people recover. Fire and Rescue have already stopped responding. Monroe County is not responding at all any more. The hospitals are closed and all businesses are closed and winds are getting strong enough to make the Highway unsafe to travel even though it is not officially closed. Birds not of a feather huddling together. Anticipating...corny I know but I couldn't resist. Artistic shot of hurricane shutters. Even the nudie bar and liquor store are closed. The car under the eave is to ease the fears of the owner in a Category Five. The weirdest shutters I have ever seen, plastic sheets clipped to the house very professionally. One of our local subjects talking loudly to herself and refusing help lest you freak out. She's been though more storms than you've had hot dinners. Kristi was glad to see me! I think. I was glad to get back into the building as the wind and rain increased exponentially. There is something magical about this hurricane evacuation that has been like no other. Just about everyone has left. Usually you get a bunch of blowhards who will never pack their bags and they mock those that do. This time everyone got into gear and drove north. In the 1971 movie the Omega Man refers to the last letter of the Greek alphabet and therefore the last man alive, Charlton Heston who lives alone in a world of weird night zombies who try to figure how to dislodge him from his fortress high rise apartment. The daylight hours are his, all by himself in his convertible with his gun. That favorite car goes up on the ramp, even though it lacks a roof and doors. 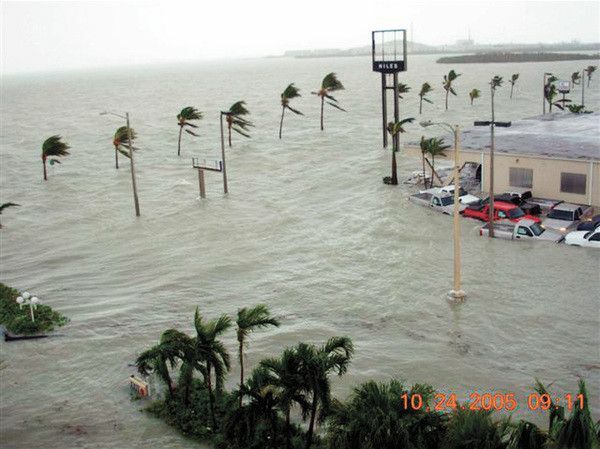 It's all about avoiding flooding which became a huge issue after Hurricane Wilma flooded the Keys in 2005, right after Katrina flooded New Orleans. Before that I never saw such attention to flood possibilities. Across the street I saw the perky multi colored Habitat homes built over the protests of the then neighbors who thought they would lower the tone of the place. I guess they were wrong. And one of the three places still open to sell booze was Conchtown Liquors, I also saw Bare Assets and Don's Place functioning yesterday in some capacity. People often get upset because homeless residents display a streak of irritating independence. Many don't want to go to the shelters, they want to drink. And so they do and visitors see them and complain no one loves them. Which is unfortunate because a community of this size rarely offers as many services for the homeless and working poor, including a place to sleep, food and medical care. In other news Monroe County appears to be shutting down rather faster than the city. The Sheriff's phones are shutting down today and its not clear how many services will be in the county by the time this Category Five storm comes to town....My Facebook link is at the top of the link column on the left side of this page. I will keep posting there as long as I am alive and have a phone signal.